We strive to eat healthy on the week days and indulge on the weekends, and one of my favorite ways to indulge is a decadent breakfast. I adore Eggs Benedict, and absolutely love the southern treat of cheese grits. I found this yummy and healthy recipe for strawberry shortcake waffles on the Sweet Laurel Bakery blog – yum! – and can’t wait to make them for my family. I think this recipe would even be a perfect celebratory breakfast for Father’s Day. Click here for the details. Enjoy! Heat and grease waffle iron with coconut oil.Mix all ingredients except eggs in food processor or blender on high. Switch food processor or blender to low and slowly add eggs. (This mixture can be made the night before and sit in the refrigerator until use). Pour into waffle iron and make according to waffle iron instructions. After the coconut cream has set in the fridge overnight, the coconut fat solids separate from the coconut water. Beat the solid coconut cream on high speed until cream is peaks form. Slowly stir in the maple syrup and vanilla extract. Refrigerate until use. 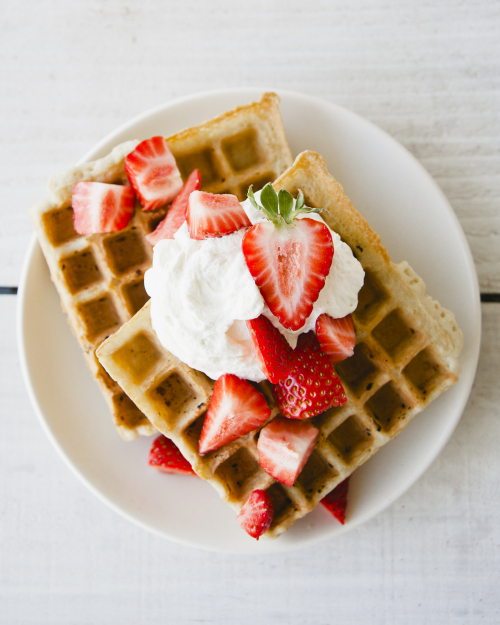 Top waffles with coconut cream and chopped strawberries!